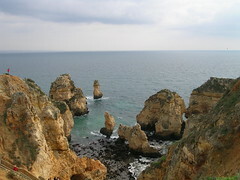 Overview: This ride is ideal for anyone visiting the Western Algarve and staying in the Lagos and Portimão area. 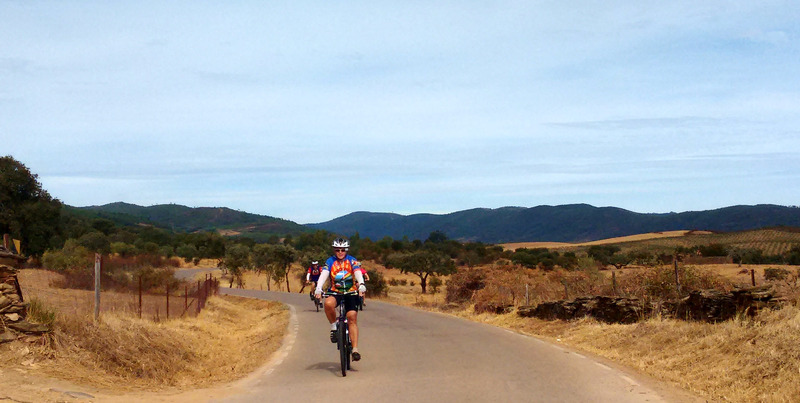 You could tackle it as a tough one-day ride – or split it into two with an overnight stop in the hills at Monchique. Click on the map for more details or to download as a .gpx file etc. 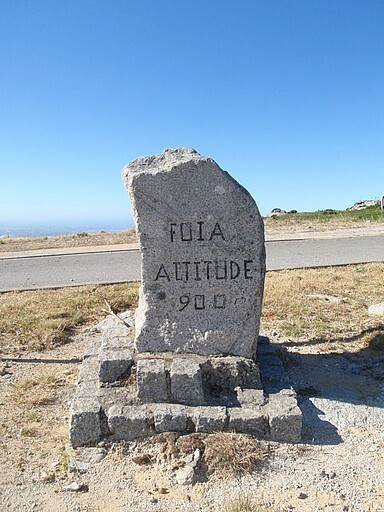 The ride has been recommended by fellow cyclist and Algarve resident Andy Smallwood, who says many cycling groups use the extension to the summit of Fóia as a training ride. Climbing is most definitely involved! Distance & Difficulty: This will be a tough ride for most riders. The total distance is about 93km (56 miles) but – more crucially – it starts practically at sea level. The village of Monchique is at an elevation of about 450m and if you go all the way to the summit of Fóia that’s at 902m! Details: The map for this route begins in the village of Mexilhoeira Grande but anywhere between Odiaxere and Mexilhoeira will do just as well – the important thing is to give yourself a bit of a warm up before starting the climb. Heading north away from the start, you’re very quickly on country roads and into lovely scenery. From January on, not only are the fields around here at their greenest but you’ll see drifts of almond blossom appearing everywhere and the spring flowers won’t be far behind. The first 15km or so of the ride are fairly gentle. After turning onto the N266, the ascent quickly starts to increase. There are wooded hills on both sides and you’ll be climbing steadily. After about another 8km, you reach the small spa centre of Caldas da Monchique – which has hotels and a restaurant as well as places to sooth any aching muscles! Caldas is at an elevation of about 240m. From there you’ve got about another 7km and around 200m of climbing to reach Monchique itself – a small hill town famous for its smoked ham. 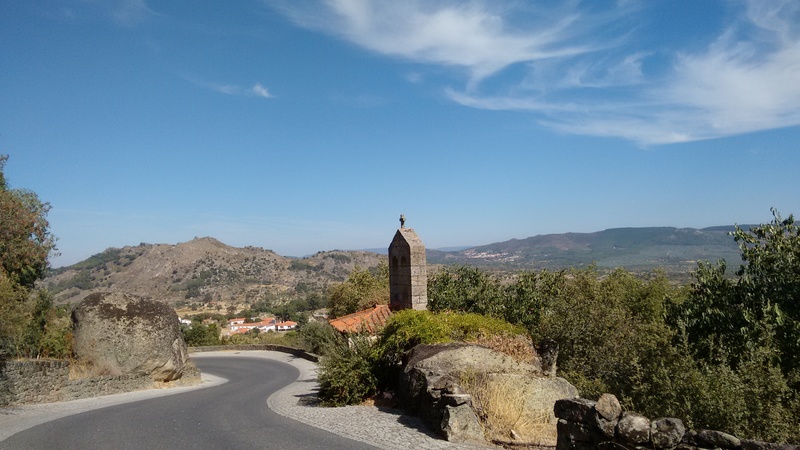 You could turn back here – in fact there’s no need to go to Monchique at all. After Caldas, you can turn left on the N267 and save yourself 4km of climbing. But then you wouldn’t get to enjoy the downhill return journey. After descending to Monchique, retrace your steps to the junction with the N267, which then takes you on a relatively level route towards the village of Marmelete – the road isn’t flat but you’ll be staying fairly close to the 400m contour line most of the way – gradually rising to 500m. There are wonderful views as the road wriggles its way west, gradually descending to Marmelete. Keep going for about another 5.5km and then turn south towards the Barragem da Bravura. (For some reason, Google identifies the lake as the Barragem de Odiaxere but it’s more commonly known, and signposted as, the Barragem da Bravura.) It’s then downhill out of the trees and into quiet countryside for the final run down towards Odiaxere and back to the start. You can either go into Odiaxere or take the route shown on the map, which takes you via some tiny back lanes. Either way, you’ll have to ride for a short distance on the N125, which can be busy, although there is a reasonably wide shoulder. 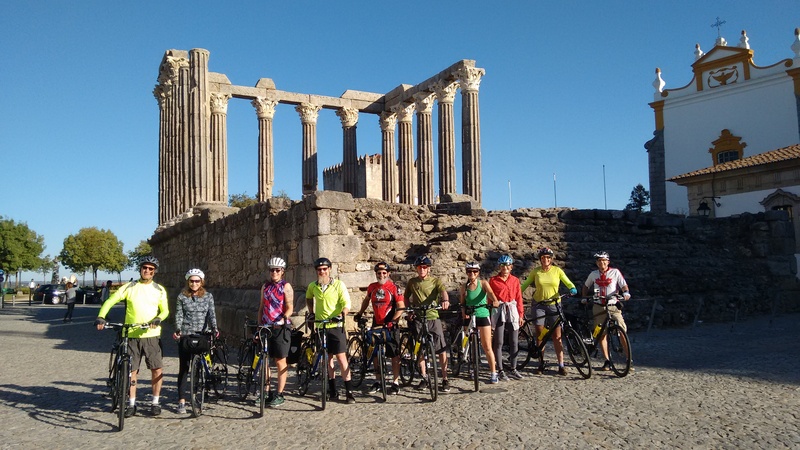 Facilities: You’ll find cafes and shops in any of the small towns near the start of the ride – Odiaxere, Mexihoera Grande and Figueira – as well as in Monchique and Marmalete. 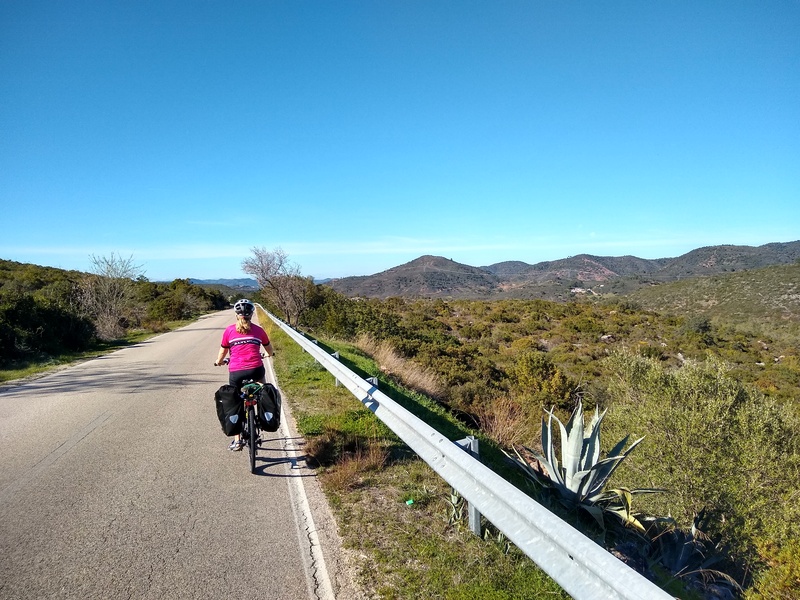 If you want to split the ride into two, then there’s a range of accommodation in and around Monchique, as well as at Caldas da Monchique. The bigger towns nearby – Lagos and Portimão – offer a range of accommodation options, as well as supermarkets, bike shops etc. 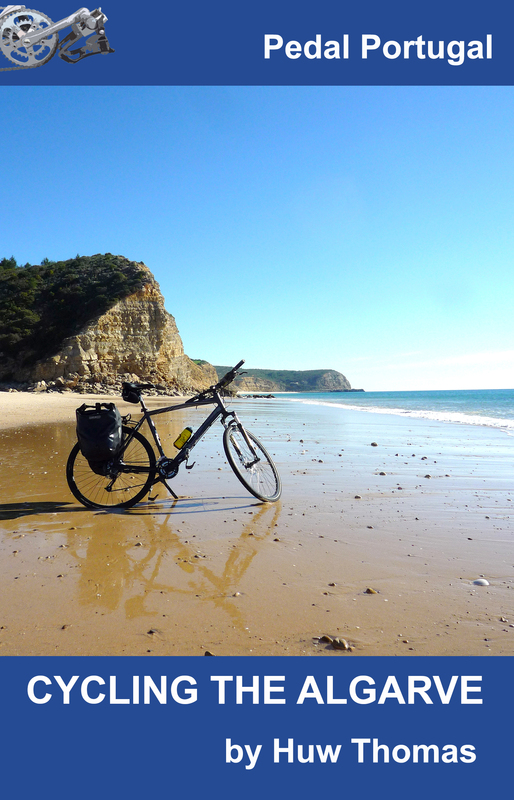 Hi – I’m keen to tackle this ride ‘Monchique Explorer’ one day between Sat 7th April 2018 – Mon 9th April 2018 if anyone is interested to join me? A long shot i know but you never know! I’m from Australia an am visiting Portugal at this time. I don’t have any local contacts but you’re probably best putting a post on a local Facebook site or expat forum if you can find one. Hi! I’m interested in the Monchique Explorer ride, but I don’t see the actual route on the map. Is there some more detailed place where we can get instructions on where to start, which roads to take, etc? Thanks! Hi. Sorry – the map got corrupted when Google Maps updated their system (grrrr). I have now created a new map using ridewithgps.com – click on the link and this will also give you a full ride profile showing inclines.